Mr Little’s auction house, Barnard Castle, Co. Durham. I am about eight and I spot an interesting-looking orange book on an old table. It is Little Women. I pick it up and show it to my mother who says in surprise, ‘Haven’t you read it?’ I shake my head. She takes the book and marches off to find Mr Little; two minutes and half-a-crown later, the book is mine. 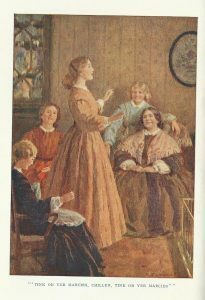 I loved, read and re-read Little Women (1868) throughout my childhood. 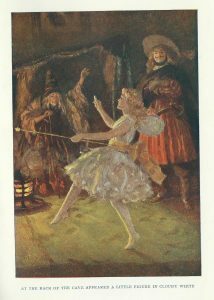 The hardback copy my mother bought me was published in the 1930s with illustrations by Percy Tarrant (1855-1934), and it’s a particularly nice edition. Tarrant was a prolific illustrator and many of his paintings are of winsomely sentimental young girls. 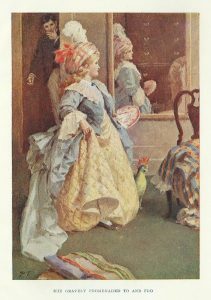 His illustrations for Little Women, however, are different. He has obviously done his homework with regard to costume and so on, and he has, equally obviously, read the book carefully and respects Louisa May Alcott’s story, and the characters of the four sisters, pretty Meg; tomboy Jo, who’s a secret writer; shy Beth and budding artist, Amy. The March girls loved the theatre and Jo wrote some splendid melodramas for all the sisters to act in. In this one, Meg plays the witch, Hagar; Jo plays both the villain, Roderigo, and the hero, Hugo; Beth manages to do the small parts; and Amy makes a wonderful sprite. School friends are invited to watch. I, too, wrote plays throughout my childhood and pushed my reluctant brothers into taking part. I was 100% behind Jo and her sisters, here. I envied Jo her knee high boots and slashed doublet. For me, Tarrant’s picture was the perfect illustration. Mrs March, the girls’ Marmee, has just delivered a gentle sermon about counting your blessings. Meg finds the family’s poverty difficult – she remembers the time when they were richer; Jo is an unwilling companion to the querulous Aunt March; Beth, who loves music, pines for a piano; and vain little Amy has to wear her cousin’s horrible cast offs. It is Aunt Chloe in Harriet Beecher Stowe’s anti-slavery best-seller, Uncle Tom’s Cabin (1852) who says, ‘Tink ob yer marcies, chillen, tink ob yer marcies’. Chloe is Uncle Tom’s wife, separated from her husband by a cruel slave owner who sells him. In Tarrant’s picture, Jo is standing centre stage with Marmee sitting listening. Amy stands behind Marmee. Meg, on the left is busy sewing and Beth is sitting in front of the window. 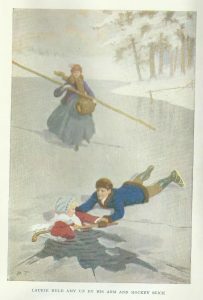 This picture shows the awful incident when Amy falls through the ice. Jo and Amy have had a serious quarrel and Jo has not forgiven her sister when the accident happens. Amy nearly drowns and is only rescued by Laurie’s quick thinking. What I like about it is its restraint. It’s not a dramatic picture and the sobriety of the artist’s palette gets across the intensity much more than shrieks and flailing arms would have done. Note that Jo wears a patelot, a long shaped jacket, and carries a muff – absolutely right for the period. 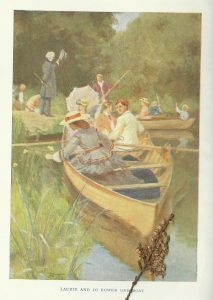 Laurie, the girls’ neighbour and a particular friend of Jo’s, has invited them all to a summer picnic, a game of croquet and rowing on the river. Old Mr Lawrence, Laurie’s grandfather, raises his hat to them and waves them off. According to the book, Jo wears a ‘scarlet and grey boating suit’ and this is exactly what Tarrant has given her. As a child, his accuracy pleased me greatly; I felt that Percy Tarrant could be trusted. 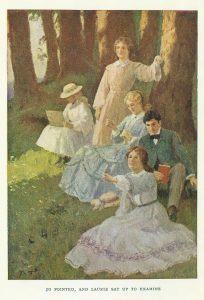 Naturally, it is a day of trials – Miss Kate from England is snooty towards Meg, who, in her eyes, is only a lowly governess; and her brother Fred annoys Jo by cheating at croquet. It is September and the sisters, who have set up a Busy Bee Society, decide to take their work outside and settle in a field by a grove of pine trees. Meg sews, Amy draws, Beth collects pine cones, and Jo knits and reads to them. A bored and discontented Laurie joins them. The chapter is called Castles in the Air and they exchange confidences about their hopes for the future. I was a romantic child and Meg’s hidden heartache touched me; but I found Beth’s lack of ambition just pathetic, I simply didn’t get the pure angel in the house scenario. I could understand Amy and Jo. I loved drawing and learning about Art, and, as a young child, I wrote poems and plays. I started my first, very melodramatic, novel when I was ten – Jo would have understood me, I felt sure. Again, Tarrant’s drawing accurately shows the hairstyles of the time. In America, young girls’ hair was parted in the centre and tied loosely at the back. Only poor girls, like the Hummel family, had their hair hanging loose. Ladies’ hair had more propriety. The last picture shows Amy, who is in quarantine from Scarlet Fever, at Aunt March’s. During her spare time, she dresses up in the old-fashioned, late 18th century costumes she finds in a spare chamber and solemnly curtseys to herself in the glass and flirts with a fan. We can see Laurie’s amusement as he watches her from the half-open doorway. I loved this picture; I, too, enjoyed dressing up. I often tried on my grandmother’s wedding dress with its whale-boned corset; or my mother’s leopard print shorts and top, and a tail! which she wore at a 1930s Jungle Party. In it, I could pretend to be Mowgli. There were lots of ways in which Little Women appealed to me. 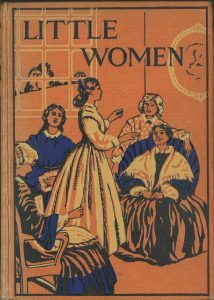 The fact that it has never been out of print shows that Louisa May Alcott understood the insecurities of young teenage girls. Our 21st century world is very different, and the anxieties are expressed in different ways, but human nature is much the same. I’d like to end with three cheers for Percy Tarrant. I think his illustrations capture both the period and the essence of the book perfectly. They are a touch ‘misty’ but I assure you that’s exactly how they are. A happy, healthy and prosperous New Year to you all. Little Women was one of my favourite childhood reads; I wept over Beth’s scarlet fever, laughed out loud over the salt in the strawberries, and coveted Jo’s russett boots. And, o course, I fell wholesale in love with Laurie, with his wicked black eyes – I never quite forgave Jo and Laurie for not getting together in the sequel, Good Wives. Thank you, Elizabeth, for this lovely reminder of a beautiful book. Thank you for joining in the conversation, Prem. I, too, coveted Jo’s russet boots. She was a brave girl in many ways, and I’ve always admired that in her. Thank you, Susie. I think so, too. Percy Tarrant obviously put a lot of hard work into getting the illustrations right. Thank you for sharing these exquisite illustrations and your comments. I’m delighted that you enjoyed the post, Rosemary. Delightful images. And yes, one of my childhood reads too. I read all the books eventually. And loved the Professor much more than spoiled Laurie. I thought he and Amy were well suited. Thank you for your interesting observations, Elizabeth. I was never sure about Laurie; he didn’t seem very manly, somehow. I agree that he and Amy were well-suited. But I wasn’t really a fan of the Professor either – too much beard. (Unless he’s Gabriel Byrne, of course) I’m not sure that Louisa May Alcott portrayed men as well as she did women. Mr March is rather too high-minded for me. I was pleased to see that in Heidi Thomas’s adaptation she allowed Jo some plain-speaking about the need for pragmatism; essential things have to be paid for somehow. I wore out my first copy of Little Women. It included a picture of Jo up in the garret, eating russets snd reading. It wasn’t until I was older and living in Connecticut that I discovered the error in the picture. My book showed Jo with a bunch of lovely red apples. Russets are golden-brown with speckles, snd very tart. Thanks to the book, the first time I saw russets at my local orchard I HAD to try them, snd they became my favorite. Thank you for your contribution to the conversation, June. What a lovely story. It’s so nice when things like that happen.